A year ago, the launch of iPhone 3GS was pitted against the new Palm Pre, which had been building up marketing steam over the previous six months. Yet when Apple's new phone launched, the Pre's hype collapsed while the iPhone 3GS set sales records, despite offering few of the flashy new features of Palm's first new webOS smartphone. Apple's iPhone 3GS offered no web-based multitasking, no inductive power charging slab, no slide out physical keyboard, no removable battery, and no LED camera flash, the features that pundits predicted to be important differentiators of the Palm Pre. On the other hand, Apple's next phone matched or beat the Pre in features that seemed to matter to end users: processor speed, camera quality, battery life, global search, and stereo Bluetooth support. Since the release of last year's iPhone 3GS, the webOS-based Palm Pre has faded into the shadows, leaving competition with the iPhone to a series of new smartphone introductions from Motorola and HTC running Google's Android OS: the HTC Hero/Droid Eris, Motorola Verizon Droid, HTC/Google T-Mobile Nexus One, the HTC Droid Incredible, and HTC Sprint EVO 4G. Good enough, or too good? Google's release of Android OS 2.2 "Froyo" also fueled competitive heat directed at iPhone, although Apple continued selling a record number of iPhones in the first calendar quarter of 2010, and largely focused attention on the new iPad in the second quarter. With Apple now gearing up for the launch of iPhone 4, the question is: will Apple's new smartphone be good enough to stand out in a market bathed in Android news, or will competition from Android devices shatter when iPhone 4 hits the market? Unlike PCs, which have been dominated by the monoculture of Microsoft Windows for 15 years, most consumer markets are flush with direct, open competition: there are lots of competing manufacturers in cars, motorcycles, bicycles, refrigerators, televisions and other consumer products, so there should be no problem with multiple vendors of smartphones. Everyone should be able to bring products to market and find buyers, if their products are good enough. On the other hand, Apple has been on a tear over the last decade in introducing products that competitors (including much larger, more experienced, and formerly entrenched companies) haven't been able to match. For nearly ten years of iPod introductions, Apple continually grew with little effective competition from Sony and Microsoft, largely creating the market for hard drive based MP3 players and subsequently taking over the flash memory MP3 player market before releasing the iPod touch, which has no real competition from anyone. The iPhone and iPad have followed similar trajectories, facing a series of ineffectual "killers" that didn't even make a dent in Apple's recession-busting sales records. One difficulty in making comparison between Apple's smartphone and alternatives running Android is that they're not the same thing. One can compare iPhone hardware features against an Android model, for example, but the value of iPhone 4 isn't just its hardware, it's the integration of its hardware paired with the iOS software designed to make it useful, and its integration with Apple's iTunes and its MobileMe cloud services for media and app management, software updates, push messaging, remote administration, and other features. Conversely, one can dismiss all of the value of iPhone 4 if using it means, for example, being tied to a single carrier in the US that provides unusable coverage for the user where they live. In such a scenario, picking a far inferior feature phone would be better if the goal were to actually place phone calls. Individual circumstances and preferences color what choice makes the most sense to a particular user. However, it's also important to look at the overall attractiveness of a product in the global market, as if Apple maintains its lead, then problems like AT&T's coverage holes will be resolved with network expansions and the eventual availability of iPhone on other US carriers. Conversely, if enough users flock to Android, then Apple will eventually lose its wide lead in being able to attract the primary attention of the best third party developers. To get a sense of where future momentum is headed, this series will provide a comparison of iOS and Android as platforms in terms of hardware features, desktop and cloud integration, mobile carriers, OS features, third party apps, and market share, and what these difference reveal, not just about how competitive the current offerings are, but how these will affect the viability of iOS and Android going forward. Is Android ahead in hardware features? One of the primary advantages ascribed to Android is that it should allow for more competitive choice among different hardware makers, which conceivably should result in faster advances in hardware innovation. This has particularly seemed to be the case in the last six months, when a flurry of new Android devices appeared while Apple's iPhone 3GS grew increasingly out of date in comparison. Again, as with other markets, the pace of Android-based releases will likely slow in terms of both hardware cycles and software releases, just as cars are brought to market in annual cycles. It wasn't too long ago that people complained that Apple released a new iPod or iPhone every year. Certainly, a three month cycle in new Android phones is going to be difficult to sustain. 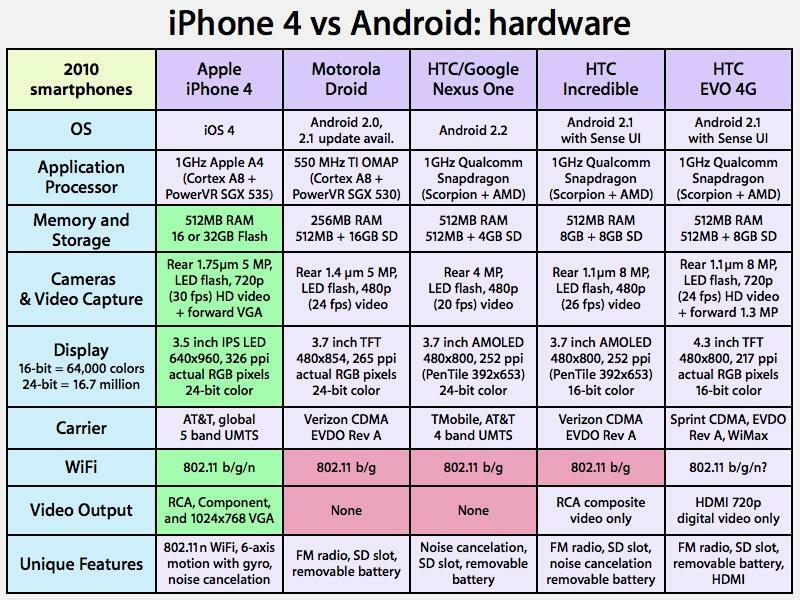 Overall however, this idea that "platform openness" automatically results in better hardware features has only been proven to give Android a temporary advantage that is now lost with the introduction of iPhone 4, which significantly outpaces top Android phones not only in interface polish and usability, but also in hardware specifications, the very thing the Android ecosystem is supposed to excel at (see chart). For example, the iPhone 4's cameras not only provide the both front facing capture and HD recording capabilities that many Android phones lack, but also captures usable 30 fps video rather than the 20 fps video of today's high end Android devices. Apple also supports faster 802.11n WiFi networking and debuted advanced, 6-axis motion sensing with iPhone 4's new gyroscope. The new phone also offers multiple mic noise cancellation, a feature only a few of the fanciest Android phones have. And iPhone 4's video iPod legacy means the device supports composite (RCA) and higher fidelity component analog video as well as the iPad's 1024x768 VGA-style output for video projectors and monitors. The HTC Incredible only supports basic composite video output (putting it on the technical sophistication of the 5G iPod from 2005), while the HTC Evo, despite packing support HDMI, delivers limited quality video output and can't output analog video at all. Most other recent Android phones offer no video output capabilities at all. So much for a purported lead in raw hardware features. The idea that an open platform should drive hardware innovation was not borne out in the PC arena. Specific PC models have often offered better graphics options and sometimes introduced faster processors quicker than Apple's Macs, for example, but Macs have long offered higher quality components, better industrial design, and often introduced or popularized new features first (such as USB, FireWire, Gigabit Ethernet, optical digital audio, sudden motion sensors, backlit keyboards, DisplayPort, and so on). Recently, the intense competition among PC makers has resulted in efforts directed primarily at achieving lower prices (achieved by cutting hardware corners or using old technology), resulting in the short term boom among netbooks. Apple has kept the bar high among Macs, resulting in better quality at a higher price. Rather than pricing itself out of the market, this has resulted in Apple's Mac sales outpacing the grown of the global PC market by a factor of around 4x. In smartphones however, Apple is maintaining a quality edge at an equal or lower price, thanks to the economies of scale the company enjoys due to its sales of tens of millions of iPods. The iPhone debuted with far more storage memory than any other phone offered, and continues to lead in that area with iPhone 4, which also packs in a huge amount of system RAM and on-board storage memory. Apple also has the resources to develop its own custom silicon for the iPhone 4's A4 application processor (the "system on a chip" that holds the CPU, GPU, supporting chipset logic, and RAM). The company also has the resources to find and gain exclusive access to best-of-breed technologies such as iPhone 4's new Retina Display high resolution IPS screen, which offers a significant leap ahead of the high resolution displays Android phones brought to market this year. Apple also has the resources (and the interest and motivation) to develop technology portfolios that support sophisticated hardware and software integration, such as the new FaceTime, which ties new camera hardware into sophisticated but easy to use software that supports video calling. In the Android world, hardware makers may include a front facing or high resolution camera, but the software that runs that camera may be poorly integrated, as was the case with both the Motorola Droid (a very high megapixel camera paired with awful software that couldn't take good photos) and the new HTC EVO 4G (which supplies a front facing video chat camera but relies on problematic, proprietary software from third parties to actually do anything). Apple's iPhone 4, like the 3GS last year, doesn't just shoot video but actually makes it easy to trim videos and distribute them. Apple's interest in making a very sophisticated (but $5) iMovie app for iPhone 4 shows the extent of its interests in pushing hardware using innovative software. That's something that is conspicuously missing on both the Windows PC and among Android mobile devices, where hardware specs are supposed to stand on their own merits, regardless of usability and practical functionality. Similarly, Android phone makers began introducing high resolution screens and new screen technologies (such as OLED displays) a few months ahead of Apple's iPhone 4, but failed to deliver software support that makes existing third party titles look good and properly fit the screen on all of the various different resolutions supported. Apple evenly quadrupled the iPhone's resolution, and provided developer support that automatically renders text and user interface elements within existing apps at the optimum resolution. Apple is also adding leading support for the latest OpenGL ES standards for graphics hardware acceleration in iOS 4 to enable game developers to create sophisticated titles that look great and perform well, while also incentivizing development of third party software using its high volume App Store, which actively discourages software theft. Even if Google delivered the same software support to take full advantage of the fast GPU hardware its partners are including on their phones, it can't attract the attention of developers because its store is geared toward hobbyists, not commercial developers. In part, this is because Google does little to protect developers from having their software "openly" stolen by users who don't want to pay for content. iPhone 4 continues to advance the state of the art in hardware via software in other areas as well, introducing the first gyroscope in a smartphone along with the CoreMotion APIs for developers to use so they can actually take advantage of it. As with Apple's other software APIs, including CoreLocation and Accelerate, the new motion-control frameworks in iOS 4 abstract away the differences in hardware between new and older iOS devices, avoiding the fractionalization problems Android experiences as each new model introduces (or fails to include) specific hardware features. The result is that Apple's iOS makes it easier for third parties to actually use new hardware. The next segment in this series will look at how Android offerings compare against iOS 4 in terms of desktop and cloud services integration.